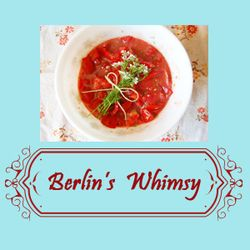 Berlin's Whimsy - june through july. My kids' birthdays are six weeks apart. Yet, somehow, that span of time between June and July feels so much shorter. So much so that their Dad & I decided to hold a few "combined" birthday parties for them when they were younger. We promised bigger and better birthday parties; but, no matter how much effort was put into the bigger and better party, one or both kids usually felt slighted. And in the end we were all overwhelmed----- Hmmm, how many of those birthday party nights closed on a 2-year old tantrum fit--- and that wasn't just the kids! I recently read this past post about my daughter----who turned 15 over a week ago: In a State of Grace. To this day, my daughter bemoans her name--- the common association of her name, Grace (being graceful---- which, she is not!). But the name, and my daughter, are so much more than the typical definition of Grace. In fact, when I read through that previous post, I nodded in agreement. And I felt so much appreciation for the grace that she brings to our family's life. She might not look like that girl I wrote about four years ago. But as much as things have changed, there are many things that have stayed the same. There were the same friends here for her birthday. She requested the same ice cream cake that's been served on her birthday for seven years. And really, it is the perfect cake for her----- the lover of ice cream with a birthday in the hottest part of the year.